The Karcher designed cartridges represent one of the many early priming systems. It is an internally primed centerfire design. The priming system consists of a disc crimped into the case with a distinctive knurled cannelure on the case near the base. The internal disc has 5 perforations which allow the flash from the fulminate priming compound to pass to the black powder charge. Of particular note are the short sharp finger-like protrusions created when the perforations (flash holes) are made in the disc. It may be the case that this is a deliberate feature and that these protrusions act as anvils to assist in ignition. 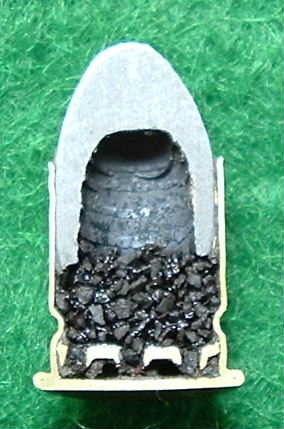 The round pictured here is an example of the 7mm Karcher. 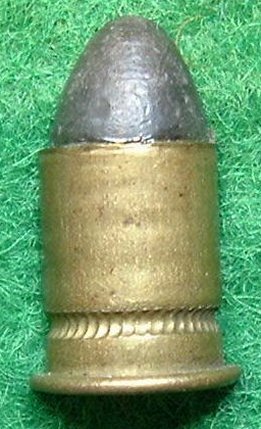 P. Karcher, who was a Parisian mechanic, patented the priming system in 1875 and used it in a variety of calibers; namely, several cane guns rounds, .320 Revolver, .380 Revolver and the 11mm Revolver (thought to be the same round as the .450) and for a subcaliber adapter for the 11mm Gras. For the sub-caliber devices, the cases were referred to as No. 1,2,3,4, etc. (as opposed to a caliber designation). The numbers referred to an incremental powder charge. Reference: Dixon, B. European Sporting Cartridges. Vol. II. 2001. p. 297.